Sixty-five. That’s the number of years the combination electrical-starter switch has been around. First used by Chrysler Corporation, it was a huge leap forward from the floor mounted push button commonly used at that time. Drivers no longer needed three feet to start the car when not parked on the level. In the space of those 65 years, something has changed to cast a pall over this simple device. It is now being blamed in the deaths of an undetermined number of General Motors car drivers. Whether true or not is no longer the issue. No amount of discovery will ever reverse the negative publicity GM is facing. But really? Is the poor little switch unfairly accused? Or is it a result of tort law and anti-big corporation sentiment? That, and quite a bit of irresponsibility? Engines have quit running for so many different reasons since their inception and yet this is the first time that the courts have been brought into it with this much fervor. There has to be a reason other than mechanical failure. Even if the case goes nowhere, at least the victim has the knowledge that it cost the corporation a ton of money, they had their 15 minutes of fame and it made them feel somewhat better having taken on the big bad giant and won. 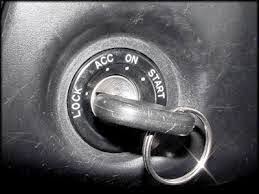 Over the years, those of us who have spent time around many different cars saw: keys that will open and start any number of the same vehicles, ignition switches that wear out enough that no key is necessary anymore or a screwdriver will turn the mechanism, switches that won’t shut the engine off and the list goes on. So what did we do? For the most part we lived with it – until someone took our car. Interestingly though, we all blamed ourselves for letting it get that far. But not today. Even though most Owner’s Manuals instruct the operator how to deal with ignition switches and some caution against loading the key chain with all sorts of gadgets, who cares? Many of us own more than one car, so that means two keys, two remotes and often a remote starter FOB. Not counting house keys, office keys and a personal item all at the end of a lanyard. Then if the switch wears out we blame poor construction or corner cutting. So what’s the difference? First and foremost: vigilance and maintenance. Then comes: an intimate understanding of the equipment. Today’s drivers aren’t taught how to deal with emergencies while driving. When was the last time a tester reached over and turned off the key on a student? Or asked them to do it themselves and coast to safety? I’d bet: never.